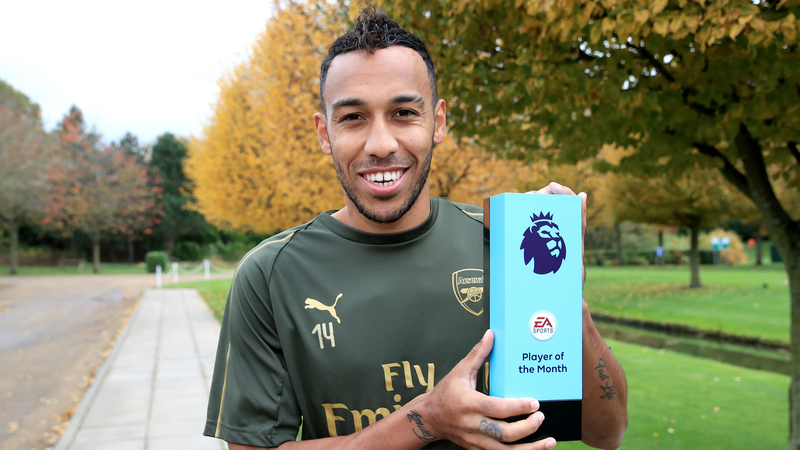 Pierre-Emerick Aubameyang has become the first Arsenal player in more than three years to win the Premier League Player of the Month award. The Gabon forward registered five goals and one assist in October to help him beat off competition from fellow nominees Ross Barkley, Fernandinho, Anthony Martial, Mat Ryan and Callum Wilson. He is the first Gunners player to win one of the monthly prizes in England's top flight since Olivier Giroud in March 2015. "I'm just trying to improve every day, trying to work a lot but I'm happy to be here in the Premier League and I try to do my best," the 29-year-old told the Premier League's official website. "We have to continue on the way we are doing things. I hope we will finish in the first four. It would be good to qualify for the Champions League." Bournemouth boss Eddie Howe claimed the Manager of the Month award for October after his side took three wins from four games. A run of victories over Crystal Palace, Watford and Fulham was halted last weekend, when Manchester United won 2-1 on the south coast. "I'm so lucky here to have such a dedicated group of people who work so hard to make sure the players are at the best of their ability," said Howe. "It is an award for the whole club and I'm very proud of everyone. "It's the unity, and not just with the players, but with the staff and with the supporters. I think that link through the club is stronger than ever. "Now we've got to make sure that we grow that and it's something we pride ourselves on, the atmosphere between people, the family-like feel of the club. "We've got to make sure we protect that at all costs."